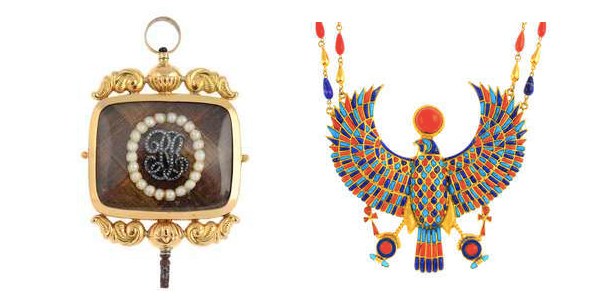 Who doesn’t get excited by Victorian diamonds or jewelry that remind us of Egypt’s golden era? Fellows’ June Antique & Modern Jewellery sale has it all. Let’s take a look at the bling! This beautiful gold diamond, enamel and gem-set brooch from the early 20th century is a real eye catcher. 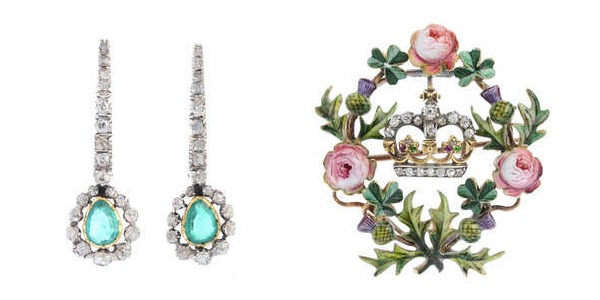 The brooch is believed to be created to commemorate the coronation of King Edward VII. In center you see the old-cut diamond crown, with rose-cut diamond, ruby and demantoid garnet accents. Another key object is a pair of late Georgian silver and 18ct gold Colombian earrings. The pear-shaped emeralds are surrounded by old-cut diamonds with similarly-cut graduated diamond line surmount. The sale’s collection of memorial pieces is as exciting as it is alluring. Take this late Georgian gold diamond, split pearl and woven hair memorial watch key for example. The woven hair rectangular glazed panel, with central rose-cut diamond monogram, split pearl surround, and the glazed hairwork ivory reverse depicting a weeping willow scene is a breathtaking example of spectacular artisanship. 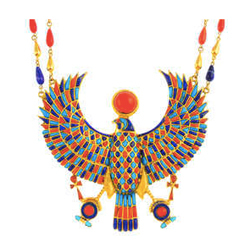 One of the most colorful lots in the entire sale, and Barnebys’ favorite item, is an Egyptian Revival gem-set necklace, depicting a coral, turquoise and lapis lazuli Horus and ankh with a similarly-set and colored bead chain and domed push-piece clasp. The ankh is an ancient hieroglyphic symbol representing life. Horus was one of the tutelary deities of ancient Egypt. Horus is often depicted as an eagle with the red and white double-crown representing the kingship of the entire kingdom of Egypt. This colorbomb of a necklace should make you feel no less than royal. The auction will take place Thursday, June 14th, but you can view the collection online today!